Bradley, R.H., Corwyn, R.F., McAdoo, H.P., & Coll, C.G. (2001). The home environments of children in the United States part I: Variations by age, ethnicity, and poverty status. This study examined the differences in the home literacy environment based on ethnicity, age, and economic status. Results showed that as children grew older the toys, books and household responsibilities reflected their growth. Children from households living below the poverty line were far less likely to have access to books or musical instruments, with African American and Hispanic children being the least likely of all ethnic groups. All children living below the poverty line, regardless of ethnicity, were less likely to be taken to museums or the theater. Parents from higher socioeconomic (SES) households were more likely to spontaneously talk to their children, and were less likely to spank their children. Prior to school entry, parents from low SES households were less likely to read to their children than higher SES parents, but the differences became smaller as the children entered school. Results indicate that there are significant differences in home literacy and parent-child interactions between high and low SES households. Jordan, G.E., Snow, C.E., & Porche, M.V. (2000). Project EASE: The effect of a family literacy project on kindergarten students' early literacy skills. Reading Research Quarterly, 35, 524-546. One-hundred and seventy-eight kindergarten students and their parents participated in a family literacy program. Parents attended five monthly sessions targeting expressive and receptive vocabulary as well as storybook reading. Scripted activities were also given to parents for use during the month. Students that participated in the study showed higher gains in general language skills than their peers that did not participate. Attendance and participation were also key aspects of the program. The more meetings the parents attended and the more activities they participated in at home, the more language skills gains observed in their children. Cook-Cottone, C. (2004). Constructivism in family literacy practices: Parents as mentors. Reading Improvement, 41, 208-216. Parents do want to help their children become better readers and to do better in school; however, they are often unsure of how to help. Certified reading specialists trained parents in read aloud, decoding, phonics and other early literacy techniques. At the end of the training, parents were observed effectively implementing the strategies with their children and reported that they felt more capable of helping their children in school-related activities. St. Pierre, R. G., Ricciuti, A. E., & Rimdzius, T. A. (2005). Effects of a family literacy program on low-literate children and their parents: Findings from an evaluation of the Even Start family literacy program. Developmental Psychology, 41, 953-970. The effects of a family literacy program were evaluated. Results showed that in order for programs to be effective, parents needed to attend and implement the strategies. For parents to effectively implement the strategies they may need training and guidance in how best to deliver the instruction to their children. Nistler, R. J. & Maiers, A. (1999). Changing parent roles in school: Effects of a 2-year study of a family literacy program in an urban first-grade classroom. Education and Urban Society, 31, 108-126. A classroom teacher implemented a family literacy program in her first grade class. The school was considered to be low socioeconomically and has a high mobility rate among the students. Observational data revealed that the parents responded well to the teacher. The teacher frequently acknowledged the parents, showed concern and interest in the parents and students, and was enthusiastic about the activities. Anecdotal reports from this study support previous research noting that teacher enthusiasm and openness to parents helps foster the home-school connection. McCarthey, S. (1999). Identifying teacher practices that connect home and school. Education and Urban Society, 32, 83-107. A synthesis of research examining home-school connections showed several facets that help facilitate better home-school connections. Understanding and acknowledging the social-cultural context of the family is a key factor. Getting to know the parents better and understanding the individual strengths and weaknesses of each family is also beneficial. This information can help the teacher suggest and provide materials that will be of higher interest to the student. Essentially the parents should be encouraged to participate and their attempts validated. Morrow, L. M. & Young, J. (1997). A family literacy program connecting school and home: Effects on attitude, motivation, and literacy achievement. Journal of Educational Psychology, 89, 736-742. In this study, parents participating in the family literacy program were asked to read to their children often, orally tell stories about their family experiences or to make up original stories, write in journals together, and were given a magazine to take home and use with their child. The parents were also asked to designate a home literacy space, attend monthly meetings, and keep record of the activities completed at home. Students with parents participating in the family literacy training showed significantly higher skills in story retelling and rewriting, and probed comprehension than control group students. Students in the family literacy group also were more likely to read or look at a book or magazine and request that someone read to them than student's in the control group. Whitehouse, M. & Colvin, C. (2001). “Reading” families: Deficit discourse and family literacy. Theory into Practice, 40, 212-219. The authors argue that in order to effectively involve parents and create a beneficial home-school link, the deficit model needs to be rejected. In the deficit model the victim is essentially blamed and it is believed that low-income families cannot or will not be able to support home literacy activities. While there are certainly more roadblocks to successful home literacy with lower SES families, the argument that there is not or will not be literacy in the home is fallacious and harmful. With training and support, lower income parents can successfully implement literacy activities in the home. Payne, A. C., Whitehurst, G. J., & Angell, A. L. (1994). The role of home literacy environment in the development of language ability in preschool children from low-income families. Early Childhood Research Quarterly, 9, 427-440. Two-hundred and thirty-six children enrolled in Head Start preschools and their primary caregivers participated in this study. The home literacy environment and the child's language skills were evaluated. Home literacy was as composite score comprised of frequency that the child was read to at home, age when read alouds began, number of picture books in the home, how often the child asks to be read to and looks at books by self, frequency of trips to the library, how often the caregiver reads by self, and amount caregiver enjoys reading by self. The home literacy environment was shown to be a significant factor in a student's expressive and receptive language. Purcell-Gates, V. (1996). Stories, coupons, and the “TV Guide”: Relationships between home literacy experiences and emergent literacy knowledge. Reading Research Quarterly, 31, 406-428. Researchers observed how print was used with children. They focused their observation on reading, writing, looking at print and talking about print. The observations revealed that over half of the family time was spent on entertainment or daily living tasks. Only 12% was spent on school-related activities, and 15% spent on literacy/storybook reading. Wide ranges of text types were also observed in the home, everything from TV Guide to novels to children's literature. Regardless of the type of texts, young children learn about written language and its uses from such exposure. The results from this study led the authors to infer that the more experience and exposure students had to print prior to starting school, the more likely they were to understand that reading and writing are used to communicate and carry meaning. Storch, S. A. & Whitehurst, G. J. (2001). The role of family and home in the literacy development of children from low-income backgrounds. New Directions for Child and Adolescent Development, 92, 53-71. And examination of 367 Head Start preschool students found that a significant amount of their vocabulary (comprehension skills) can be attributed to home and family characteristics. The literacy environment, parental expectations and parental characteristics all comprise home and family characteristics. The literacy environment was determined by examining how often and for how long children were read to, the number of books in the home, number of visits to the library, how often the child asks to be read to and how often the child looks at books alone. How well the parent expected the child to do in reading and spelling as well as the parent's education, vocabulary skills and reading practices also contributed to home and family characteristics. Each factor contributed differently to the student's vocabulary. Frequency of read alouds and how often the child asked to be read to were among the biggest contributors. Frijters, J. C., Barron, R. W., & Brunello, M. (2000). Direct and mediated influences of home literacy and literacy interest on prereaders' oral vocabulary and early written language skill. Journal of Educational Psychology, 92, 466-477. Ninety-five children from urban kindergarten classes participated in this study. Results showed that the frequency that children were read to and how many storybooks parents could identify coupled with the student's interest in literacy significantly contributed to the child's letter-name and letter-sound knowledge. Student literacy interest was determined by whether the child reported that he or she liked to read or look at books, liked to receive books as presents and enjoyed going to the library. This study suggests that both parent involvement and student interest are important variables for fostering a student's phonological awareness. Britto, P. R. & Brooks-Gunn, J. (2001). Beyond shared book reading: Dimensions of home literacy and low-income African American preschoolers' skills. New Directions for Child and Adolescent Development, 92, 73-89. Preschool children and their teenage mothers were used in this study, and observed over a 3-year period. Observations showed that the more a mother talked to her child during a read aloud, the more language the child expressed. Children's expressive language was also positively associated with more frequent and sophisticated language from their mother's during a puzzle-solving task. Homes that supported the child's needs and provided support for learning were more likely to result in the child being ready for school. Bus, A. G., van Ijzendoorn, M. H., & Pellegrini, A. D. (1995). Joint book reading makes for success in learning to read: A meta-analysis on intergenerational transmission of literacy. Review of Educational Research, 65, 1-21. The meta-analysis conducted found that book reading and the parent-child interactions that occur during book reading yield higher scores in language growth, emergent literacy and reading achievement. These results occur regardless of the socioeconomic status of the family. 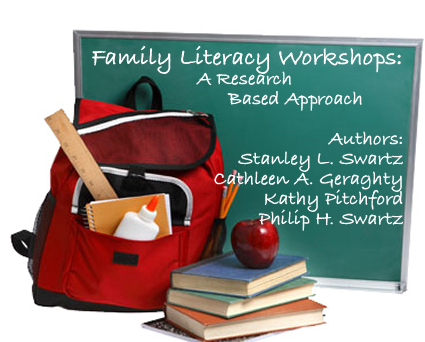 Essentially, good family literacy practice works for all families as long as the strategies are implemented. Results also showed that book reading and exposure to print may make school entry easier. Leseman, P. P. M. & de Jong, P. F. (1998). Home literacy: Opportunity, instruction, cooperation and social-emotional quality predicting early reading achievement. Reading Research Quarterly, 33, 294-318. This study examined the home literacy practices of families with young children in the Netherlands. The findings are similar to those found for families in the United States. The more opportunities that children have to interact with print, the more ready they are for literacy instruction when they begin school. Higher quality interactions (e.g., positive interactions with parents, non-authoritarian exchanges) between the parent and child also result in higher vocabulary and early literacy growth. Sénéchal, M., LeFevre, J., Thomas, E. M., & Daley, K. E. (1998). Differential effects of home literacy experiences on the development of oral and written language. Reading Research Quarterly, 33, 96-116. Approximately 150 kindergarten and first grade students from middle and high socioeconomic families participated in this study. About 2/3 of the sample were kindergarten children with the remainder in first grade. This study examined how different aspects of home literacy affect student skill development. Read alouds result in student oral language development, while teaching reading (e.g., letter identification and sounds and phonemic awareness activities) resulted in the development of written-language skills. Both of these skills together are significant predictors of reading skill measured at the end of first grade. Saint-Laurent, L. & Giasson, J. (2005). Effects of a family literacy program adapting parental intervention to first graders' evolution of reading and writing abilities. Journal of Early Childhood Literacy, 5, 253-278. One-hundred and eight first grade students and their parents participated in a family literacy training program. The training focused on effective ways of reading books aloud, ways to gain access to books, listening to children read, letter play, and the functionality of reading and writing. Children who had parents that participated in the program showed higher reading and writing growth than their peers not participating. The writing from the students in the experimental group had better sentence structure, vocabulary, spelling and length of text. These effects were seen regardless of the socioeconomic status of the schools. Cooper, H., & Valentine, J.C. (2001). Using research to answer practical questions about homework. Educational Psychologist, 36, 143-153. While there are positive benefits to homework (e.g., fostering of independence and improvement of study skills), there are familial characteristics, such as the support that students receive at home, that make homework an unequal task from one child to another. The effects of homework vary by the grade of the student. Elementary age students benefit more from in-class supervised study, and junior and senior high students show modest associations between the time spent on homework and academic achievement. Hoover-Dempsey, K. V., Battiato, A. C., Walker, J. M. T., Reed, R. P., DeJong, J. M. & Jones, K. P. (2001). Parental involvement in homework. Educational Psychologist, 36, 195-209. Homework was found to have a positive efffect on parent and families where parents are able to demonstrate their interest and support of the child’s schoolwork. A review of the research found that parents involve themselves in student homework because they believe that they should be involved, believe that their involvement will make a positive difference, and perceive that their children or children's teachers want their involvement. Parents' involvement activities take many forms, from establishing structures for homework performance to teaching for understanding and developing student learning strategies. Primarily through modeling, reinforcement, and instruction, parents' homework involvement appears to influence student success insofar as it supports student attitudes related to achievement (e.g, attitudes about homework, perceptions of personal competence, self-regulatory skills). Corno, L., & Xu, J. (2004). Homework as the job of childhood. Theory Into Practice, 43, 227-233. Using parent interviews, this research found that homework helped children develop time and job management skills. The research casts a different light on the century-old practice of doing homework, suggesting it is the quintessential job of childhood. Homework creates a situation where the child must complete assigned tasks under minimal supervision and after little initial training. Doing well on that job gets one further along in school. As in the workplace, when children move from beginners to experts with homework, they demonstrate responsibility and become skilled at managing tasks. These positive outcomes enhance the intended deepening of students' subject matter knowledge. However, the authors believe that another virtue of homework is that it can prepare children for jobs they will have one day and it may develop an aptitude for gainful employment.